I’ve been wanting to try making a sweeter vinaigrette for some time now. I’m fond of ones like the Annie’s raspberry and mango salad dressings, but they use added sugar and I thought it would be great to replace it with some soaked dates instead. This evening I finally tried it out! Disclaimer: This is NOT a fully tested recipe yet. I am guessing on measurements of liquid ingredients. 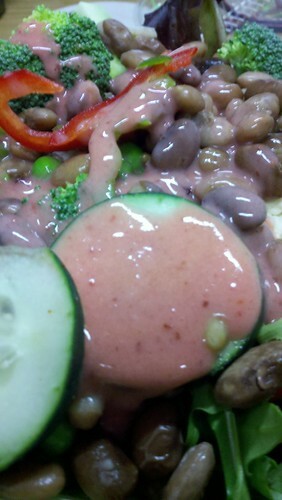 I ended up with roughly 2 cups of dressing when this was finished. Process everything except the xantham gum in a blender until everything is blended smooth. While blender is still running slowly add in xantham gum. Keep blending until dressing thickens nicely. Yes, you can skip the xantham gum, but this is a fairly easy-to-find, not-scary additive that really gives salad dressing a thick, stick-to-your-veggies consistency. In this case there’s a little bit of oil added and the xantham gum further helps by keeping the oil emulsified with the vinegars and fruit. Pour into bottle and store in fridge. Use up over the next few days.